Last night the Obama administration delayed until 2015 the implementation of a major provision of the Affordable Care Act requiring employers to provide health insurance coverage for all employees that work over 30 hours a week. In his statement explaining the rationale for the delay, Treasury’s Assistant Secretary for Tax Policy Mark Mazur used some interesting language to describe the role of employers in the interim before implementation. He said the delay “will provide time to adapt health coverage and reporting systems while employers are moving toward making health coverage affordable and accessible for their employees” (emphasis added). Whether intentional or not, Mr. Mazur used the language of disruptive innovation to describe employers’ duty regarding health care costs. I believe he used this language appropriately– the theories of disruptive innovation pioneered by Clayton Christensen suggest many large employers have an opportunity to disrupt the traditional health insurance business model, make care more accessible and affordable for their employees, and prove Mr. Mazur’s words prophetic! 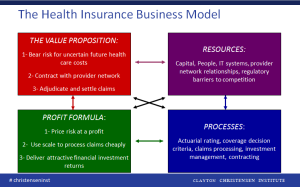 The traditional health insurance business model (and any other kind of business model) begins with a value proposition, which in this case is three-fold:1) bear risk for uncertain future health care costs, 2) contract with a provider network, and 3) adjudicate and settle claims. 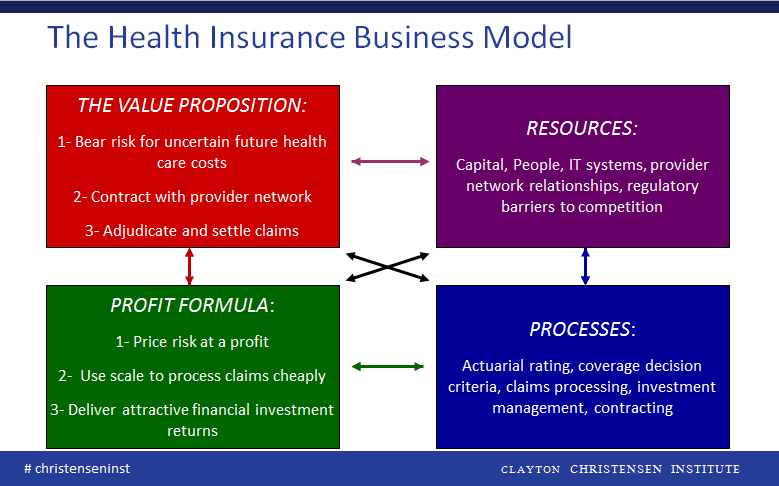 Insurance companies combine resources and processes to deliver that value proposition profitably (see image at right). If a competitor can profitably deliver the value proposition to customers with simplifying technology at lower cost, it is in a position to successfully disrupt the incumbent’s business model. Here’s a simple explanation of how each piece of the traditional health insurance value proposition is or could be disrupted by large employers. 1. Bear risk for uncertain health outcomes—Disruption is well underway on this front, particularly within managed care. According to a 2012 Credit Suisse report , 62% of the $850B employer-sponsored managed care market in the U.S. is under an administrative service only arrangement where employers bear the risk of health claims and pay insurers or third party administrators for managing the provider network and processing claims. Employers are already taking this part of the insurance value proposition in-house. We expect the trend of increasing employer self-insurance to continue going forward. 2. Contract with a provider network—We are starting to see large employers dictate the provider network to the insurer rather than the other way around. For example, last year Wal-Mart established a ‘Centers of Excellence’ program for its covered employees to receive care for complex, expensive conditions at providers hand-picked by Wal-Mart for their quality and value including Cleveland Clinic and Geisinger. Safeway has also been a leader in this regard, holding increases in its employee health benefit costs well below the national average since 2005. Part of their success has been establishing a custom drug formulary and reference pricing for a set of specified diagnostics and procedures to help its employees select the most affordable, competent therapies and care for their needs, essentially obviating the need for blind trust in the payor-assembled provider network. It would not be a huge leap for Safeway to contract directly with these providers rather than accept the much broader (and more expensive) network from its health insurance partner. 3. Adjudicate and settle claims—This part of the health insurance business model has seen the least genuine disruption to date, though it is increasingly price competitive. The scale of the incumbent insurance companies with their sophisticated claims management IT systems is difficult for individual employers to profitably replicate. Though there is no single simple solution to this challenge, there may be a number of helpful early stage technologies (e.g., NunaHealth, Eligible) to help employers attack the low end of the market. I am optimistic that as the health tech boom continues, an employer will soon be able to assemble a patchwork quilt of simplifying technical solutions necessary to adjudicate and settle its own claims. Disruption of an incumbent’s business model rarely happens all at once, nor does it always fundamentally change an entire industry on its own. Indeed, employers disrupting health insurance will not directly make the delivery of care itself fundamentally less expensive. However, a disruption of the health insurance business model by employers would likely channel demand for health care to the most efficient and affordable providers, using natural market forces to starve inefficient or non-viable business models of health care delivery. By disrupting the traditional health insurance business model, large employers (and someday smaller ones too) can indeed help make health care more affordable and accessible to their employees.